World stocks rose from this week?s 7-week low on Thursday as banking shares recovered after a heavy sell-off. World stocks rose from this week"s 7-week low on Thursday as banking shares recovered after a heavy sell-off. World stocks rose from this week"s 7-week low on Thursday as banking shares recovered after a heavy sell-off, while European government bonds tumbled on concerns the countries may borrow more to boost the economy. The yen rose toward a 13-1/2 year high against the dollar and a seven-year peak versus the euro, while sterling fell again toward the previous day"s 23-year low against the dollar. Wall Street jumped from a two-month low on Wednesday, helped by surprisingly healthy earnings reports from IBM and Apple and financials including Northern Trust , the custody bank and asset manager. In Europe, major gainers were banking and energy stocks. ?The market is yo-yoing again. The good news is it hasn"t touched new lows, and all the bad news is already priced in,? said Marc Touati, chief economist at Global Equities in Paris. MSCI world equity index rose 1 percent, having hit its weakest since early December on Wednesday. The FTS Euro first 300 index of leading European shares rose 2.1 percent. 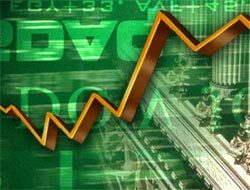 Emerging stocks rose 0.9 percent. U.S. crude oil rose 2.2 percent to $44.50 a barrel. The dollar lost half a percent to 88.95 yen after falling as low as 87.10 yen on Wednesday, the lowest since July 1995. Sterling was down 0.8 percent at $1.3867, having hit $1.3618 on Wednesday, its lowest since September 1985. The British currency has lost more than 6 percent this week. The dollar edged up a quarter percent against a basket of major currencies. Government bonds were under pressure across the board as investors unwound safer trades as stocks rebounded. Also pressuring sovereign debt is concerns that the governments would have to borrow huge amounts to help fund their package designed to support the economy. The euro zone"s second largest economy, France, will issue up to 7.5 billion euros of new 2010, 2011 and 2014 paper, as well as up to 1 billion euros of inflation-proof securities. Worries about fiscal balance have driven the cost of insuring sovereign debt of many major economies to record highs in recent sessions, according to credit default swaps data. Investors are also demanding more compensation to hold less liquid euro zone debt than benchmark German government bonds. Spreads of French 10-year bonds over German Bunds are around 60 basis points, their widest since the introduction of the euro. Portugal became the third euro zone economy this year to be hit by a ratings downgrade late on Wednesday, as Standard & Poor"s cut its long-term rating to A+ from AA-, citing slow economic reforms and deteriorating public finances. The 10-year Portuguese/Bund spread hit a new wide of 153 basis points on Wednesday. The March bund futures fell 90 ticks.